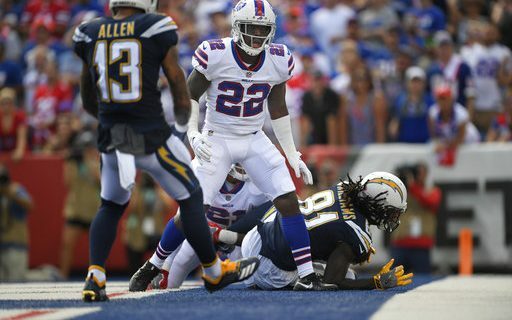 The Buffalo Bills not only suffered their second straight embarrassing loss to the Los Angeles Chargers yesterday by a 31 – 21 margin, but they also had a starting defensive back “retire” at halftime in a move that I have never seen before. Vontae Davis, who the Bills signed as a veteran free agent this off-season, decided to “retire’ at halftime when the Bills were down 28 – 6. Retire is not the correct word, but rather “quit” is. This is not the first time that Davis has had an abrupt end with an NFL team. Last year, in early November, the Indianapolis Colts severed ties with Davis over a groin injury. Davis had been playing poorly and the Colts demoted him. Davis’ excuse was that he had a groin injury that hampered his play. The Colts felt different and cut him. After seeing Davis walkout on his teammates yesterday, we have to believe that the Colts were indeed correct with their evaluation. From the outside, its looks as if Davis was playing purely for the money and when that happens a player can’t be trusted. To be a successful NFL player that player has to have a passion for the game and a desire to be a great player. It has become obvious that Davis has neither and I would imagine he will never get another shot at playing in the NFL again. Now the question is can the Bill get any monetary relief from the contract that Davis signed this past spring?. Under NFL rules, a vested veteran is guaranteed his salary for the season if he is on the 53 man roster for the opening game. Davis was on the roster last week and so his contract is guaranteed for the season. Because Davis, “retired” or quit may mean that he forfeits the rest of the salary for the rest of the year. He was not cut and so the Bills may have no recourse. According to Spotrac, Davis was given a $1.5M signing bonus, a $312,000 roster bonus and a $250,000 workout bonus along with his salary of $2.25M. The Bills may be able to recoup some of the signing bonus as well as the rest of the guaranteed salary. I doubt they will get back any of the roster or workout bonuses. It will be interesting to see how this plays out over the next few weeks. As we all know, the Bills traded up twice in the first round of last April’s Draft in order to select quarterback Josh Allen and Mike linebacker Tremaine Edmunds. Allen was getting his first NFL start yesterday and struggled as you would expect a rookie quarterback getting his first start would. Allen finished the game completing 18 of 22 throws for 245 yards, one touchdown and one interception. If you just look at the numbers, you would say he played fairly well. The numbers are not indicative of his overall play. In fairness to Allen, he did not get much of any help from the offensive line as he was under constant pressure all game and was sacked five times. The rushing game was also poor as is accounted for only 84 total yards. Allen had trouble reading the defense and making quick decisions. At least some of the sacks were because he held on to the ball too long. Like most rookies, he was slow going through the progression and finding an open target. Often there were open receivers, Allen just couldn’t find them. When he did throw his accuracy was off. His accuracy was actually worse than his completion percentage as his ball placement on many throws was off. Putting the ball in the right place can be the difference between just a completed pass or a completion and a good run after the catch. All told, I would give Allen a “C” for his performance. He did some good things but he has to improve. The problem he has is next week he faces perhaps the best defense in the NFL in the Minnesota Vikings and if he thinks the Chargers blitzes were tough to handle, just wait until he sees what the Vikings throw at him. Looking at the schedule, we knew this was going to be the case. The Bills first four games were going to be tough and that has proven to be the case. While Edmunds played fairly well a week ago, he struggled badly yesterday especially in coverage. The Chargers did an excellent job isolating both backs and wide receivers on linebackers. Edmunds wasn’t the only “victim” but the Chargers went to him quite often and were very successful. When in college, Edmunds showed good zone coverage skills but didn’t have to cover man to man that often. Yesterday he did and got exposed. He gave too much cushion and played too softly giving Chargers QB Phillip Rivers easy receptions. This is an area that Edmunds is going to have to work on daily in practice. Other clubs will see this on tape and try to do the same. Edmunds has the talent to be a good cover linebacker, it’s a matter of being confident in what he has to do.